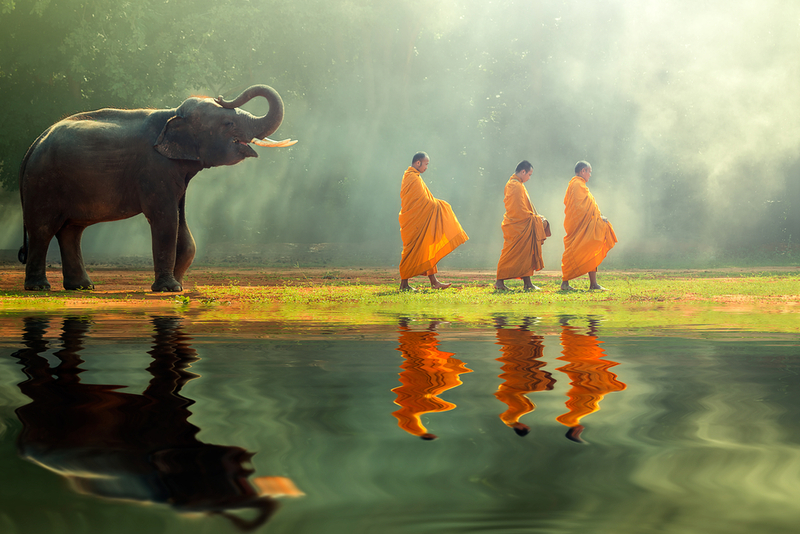 Thailand is the hub of Southeast Asia, and while many visitors fly into Bangkok, the country has so much more to offer across its 76 provinces, each with their own flavor. With lush jungles, beautiful beaches, great food, some of the friendliest people in the world, and cheap prices, there’s so much to see and do here. In truth, it can all be a bit overwhelming if you’ve never visited before, but don’t worry, because here is our beginner’s guide to ‘The Land of Smiles’. First, we’re going to take a look at the four main regions of Thailand, and what they have to offer. Thailand’s north is a lot calmer than the hectic Bangkok in the south and is definitely the place to head if you want to get up close and personal with the country’s wildlife. The mountainous terrain is home to a number of elephant sanctuaries, tiger temples, and even the Chiang Mai Night Safari, where you can see the animals in a whole new light. Not many tourists head up to the northeast of the country, which is known for its insanely spicy food. Quaint and quiet villages dot the countryside, alongside traditional rice farms, giving the area a real authentic Thai feel. Bangkok is the beating heart of Thailand, and it can be a real sensory overload, with sights, sounds, smells, and tastes hitting you from all angles! Whether it’s the street hawkers flogging tasty pad thai, the tuk-tuks zooming just past you, or the neon lights and spectacular temples that rub shoulders in this city of contrasts. Phuket and the south of Thailand may well be the most beautiful part of the country, with stretches of gorgeous beaches on the shore of the crystal clear Andaman Sea. As for how much you can expect to spend on a trip to Thailand, you should be pleasantly surprised. Thailand is extremely cheap, although Bangkok and the south of the country are still a bit pricier. If you’re happy to do things on the cheap, you can usually find a cheap guesthouse for around ฿300/$9 a night in some cities, more in Bangkok (฿400/$12), or even less in the more rural areas (around ฿200/$6). If you’re after something a little nicer (and air conditioned, which can be a must!) then you’ll need to stretch just a little bit more to the ฿600/$18 region. Proper hotels start at around ฿1,350/$39 with the big resorts in areas such as Phuket costing more in the ฿1,700/$49 region. Another popular option is to rent out a dorm room, which can cost as little as ฿100- 150/$3-4 a night. Airbnb is also on the rise and is worth a look as it could throw up some really nice surprises and a more authentic Thai experience. The food in Thailand is amazingly cheap! Make sure to try out the street food, which you can pick up for as little as ฿20/$0.60 or up to ฿50/$1.50 for more filling dishes. For the more western fare which you’re used to back home such as burgers and pizzas, you’ll pay somewhere around ฿170-340/$5-10. We recommend you don’t bother buying your own groceries in during your stay and just eat out because it’s so cheap! The local bus services won’t set you back much more than ฿8/$0.20 per trip, and there are also Metro and Skytrain services in Bangkok which cost about ฿15-50/$0.45-1.25 per trip, while metered taxis are closer to ฿60-100/$1.75-3.00. The traditional Thai tuk-tuks are popular with visitors and will cost about ฿100-235/$3-7 for a ride, while a motorbike taxi (yes, they’re a thing!) will be about ฿35/$1. If you want to travel around the country, thankfully the trains are all quite cheap with a long distance night train starting at about ฿575/$17 for the cheaper tickets and boats between islands cost between ฿250-475/$7-14. As you can see, Thailand is amazingly cheap, so with all that leftover change, it’s time to get out there and explore! This is just a brief selection of some of the sights and attractions you might want to take in during your visit to Thailand, but it’s a good starting point. The 18th-century royal palace in Bangkok is the official residence of King Rama X, although he doesn’t actually live there and the palace is more ceremonial now. It’s a beautiful building with numerous temples to visit, such as the Wat Pra Kaeo, home to the famous Emerald Buddha. Just across the road, you’ll also find Wat Pho, which is home to the huge reclining Buddha statue. About two and a half hours out of Bangkok you’ll find one of the best national parks in Thailand. It never gets too crowded here, so there’s a beautiful, peaceful atmosphere, and the sights are truly stunning. You might even catch a glimpse of a wild elephant if you’re lucky! There are a number of guided tour options available to you, with an entrance fee of ฿400/$12. Between the city of Chiang Mai in the north and Bangkok further south are the three ‘ancient capitals’, Sukhothai, Lopburi, and Ayutthaya. They make for great stop-offs on your way up to Chiang Mai (an old city worth visiting in its own right) and are a great way to learn about ancient and rural Thailand. There are seemingly endless beautiful islands to explore in Thailand, from the massively commercialized to the almost abandoned. Some of the best include Ko Samui, Ko Pha Ngan, Ko Tao, Ko Chang, Ko Lipe, Ko Samet, Ko Phi Phi Don and Ko Yao Yai. The Full Moon parties have become famous across the world, with a festival-like atmosphere. It may be super touristy, but if you like a good party, there aren’t many better than the Full Moon, and you can’t really go to Thailand and say you didn’t go to one can you? Northern Thailand is perfect for jungle trekking, with some great multi-day hikes available. Most of these hikes depart from Chiang Mai or Chiang Rai, which can be booked through your hotel or hostel. There are lots of great scuba dive sites around the country, particularly in the Similan Islands. The clear waters and varied sea life, such as fish, snappers, rays, and turtles make it an ideal place to dive, even if it’s something you’ve never tried before, with day trips starting out at around ฿3,700/$110. Make sure to check out our great deals on cheap flights to Bangkok here and book your trip today!